My sister-in-law is expecting a baby next June. Her toddler already has a Prime Factorization Blanket, and I just finished making a second one for a niece in another family. It’s time for something new! Inspired by my Fibonacci Clock (not my idea, but a clock purchased via Kickstarter) and my Fibonacci Spiral Earrings, I’m thinking about making a Fibonacci Spiral Blanket. It starts with the little white square, which represents 1. I planned to make the blanket 12 stitches by 12 garter ridges. I made the swatch 6 by 6, and think I may go with that for the blanket after all. The important thing is for it to be divisible by 3. It’s going to get big fast. Okay, after the initial square, I picked up stitches along one edge of the square. I added a new color for this square, but it’s the same size as the first, still representing 1. Since 1 = 1 + 0, I used the first color (white), but added a new color representing the new entry in the sequence. For the next square, representing 2, I picked up 12 stitches along both the previous squares. 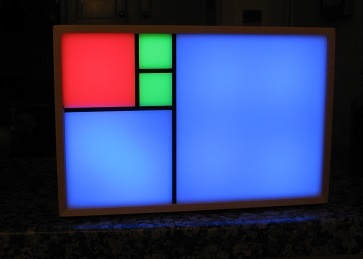 I use three colors — representing the two numbers whose sum in the new entry. This pattern will continue. Each new Fibonacci number will get a new color of its own — but I’ll alternate that with the two colors representing the two numbers I summed to get this number. And in garter stitch it turned out very cool if you alternate rows of three colors — It turns out that you will have the yarn waiting for you when you’re ready to pick up that color again on the correct side. And the garter ridges work out to look like solid stripes. There are two colors in between the ridges, but because of the way the texture works, you see the matching color ridges together. So in the swatch, the entry representing 2 was a 12 by 12 square alternating white, pink, and burgundy. For the next entry, representing 3, I picked up stitches along the square I just finished plus one of the 1 squares, so that made 18 stitches, and I went for 18 rows. I dropped the first color white, and now alternated pink, burgundy, and a new color, lavender. To finish it off, I chain stitched in a golden Fibonacci spiral. For the actual blanket, I’ll be a little more careful to make each curve circular. I think this may make a fine blanket. The squares will get big quickly, so I’m not sure how far it will go. My brother and his wife should find out the baby’s gender in January. Though I’m thinking even if the baby is a girl, I may want to use more gender-neutral colors in the middle (these starting squares) and save pink for the bigger squares that will come later. But we’ll see. I also learned a little bit by swatching about how I want to pick up the stitches. 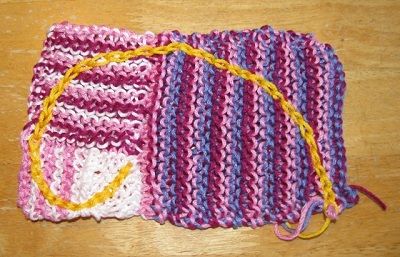 But the main lesson is that alternating three colors in garter stitch works great! And crocheting on a golden spiral works great! This entry was posted on Friday, November 27th, 2015 at 11:36 pm and is filed under Knitting, Mathematical. You can follow any responses to this entry through the RSS 2.0 feed. You can leave a response, or trackback from your own site.